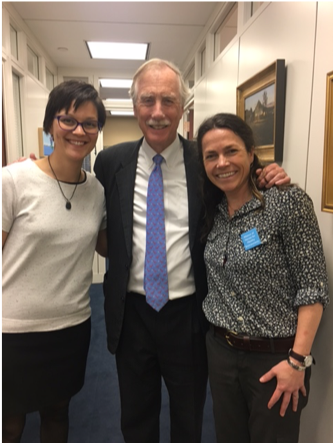 Today’s Nurses Week Profile follows Samantha Paradis, a critical-care nurse studying to become a family nurse practitioner, and her work in addressing environmental health in her nursing practice and as the Mayor of Belfast, Maine. One of the most prominent areas of concern identified by Mayor Paradis is how environmental factors effect the asthma rates in the state, which are among the highest nationwide. “We are geographically located in what is commonly called the “tail-pipe” of the country”, she states. “Pollution is carried by the Gulf Stream and air patterns across the country to Maine. This leads to high levels of airborne particulate, smog, smoke, and soot.” As state residents struggle with asthma, Samantha emphasizes the importance for nurses to be up to date on current standards of care and best practices when caring for affected patients. As mayor, Samantha has been able to expand her environmental work and translate that into community, state, and federal level action. Her first initiatives in office included successfully advocating for the development of a city climate change committee, which she chairs, that is focused on identifying how the city can respond to challenges posed by climate change; working with the Mayors Coalition to support efforts to expand renewable energy in in the state legislature; and advocating for continuation of the Brownfields program with federal legislators. She is already seeing successes from her work as the city council voted last month to install solar panels at a new public works facility and to install two electric vehicle chargers that will be free for public use. Samantha Paradis, MPH, BSN, RN, CCRN, FNP-S: Growing up in Frenchville, Maine Mayor Samantha Paradis learned the value of hard work at a young age during the annual potato harvests. She found her love for nursing and the importance of community and public service through her work at a local, family owned nursing home. Mayor Paradis attended nursing school at the University of Maine. Through the support of the Mitchell Institute she interned at the Mayo Clinic, later starting her career at the teaching hospital. After returning to Maine she started working as a staff nurse at Waldo County General Hospital and is currently studying to become a family nurse practitioner. Mayor Paradis enjoys a healthy work/life balance and spends time training with a women’s gig rowing team. They are heading to the international gig rowing championships in England in May. In November 2017 she was elected the youngest and first queer Mayor of Belfast, Maine.